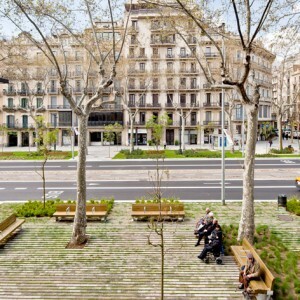 Lola Domènech: The layout of paseo de St Joan as an important 50m boulevard was first laid down by Ildefons Cerdà in his Ensanche project, approved in 1859. 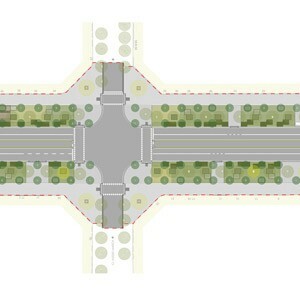 Cerdà’s isotropic layout of 20m-wide streets also features various main 50m-boulevards with wide pavements lined with two rows of trees as well as a central roadway. 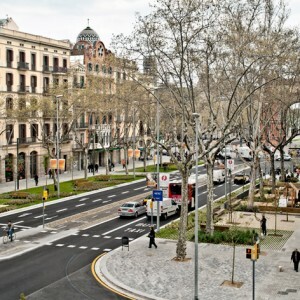 Passeig de Sant Joan is one of these. 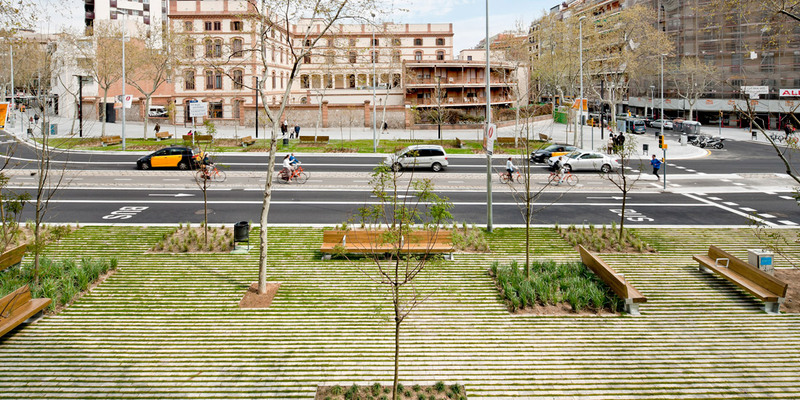 Josep Fontseré’s Ciutadella project (winner of the 1872 contest) featured a new central promenade which was to prolong the Salón de St Joan. 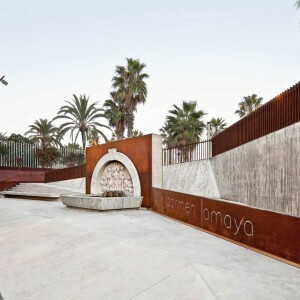 The Ciutadella fortress was demolished and turned into a public park and this led to the prolongation of paseo de St. Joan thus recovering the vertical axis featured in Fontseré’s project. 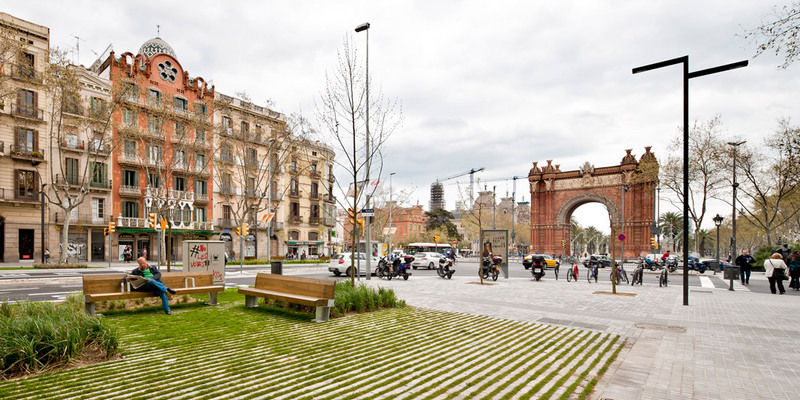 Sections 1 and 2, from Arc de Triomf up to Mossen Cinto Verdaguer square are very similar and only vary in the way the traffic lanes are distributed. 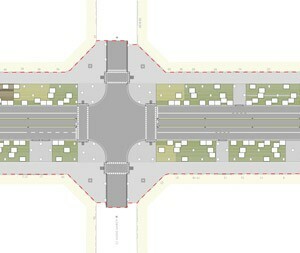 In both sections the layout is symmetrical with 12.5m pavements, a 25m roadway for vehicles and a central bicycle lane. 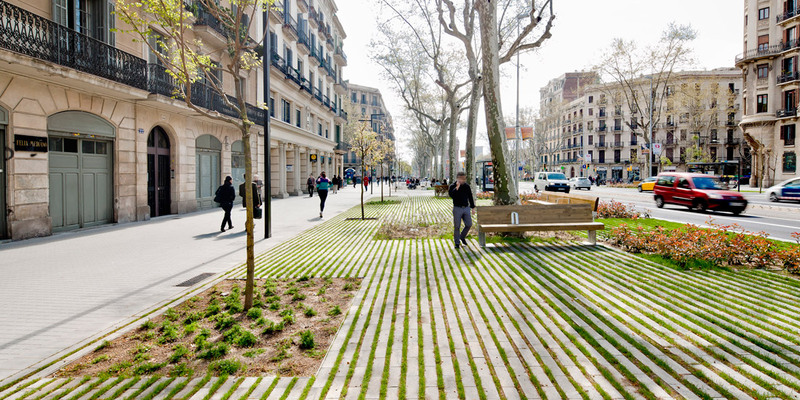 On certain sections of the pavement there are discontinuous parterres which are in a very bad state and create a very fragmented impression. 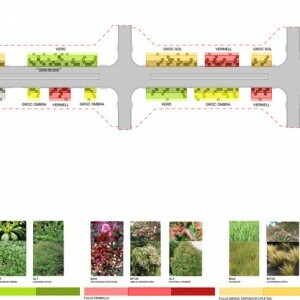 The state of the road paving and the pavements is very precarious causing problems of pedestrian and road accessibility. 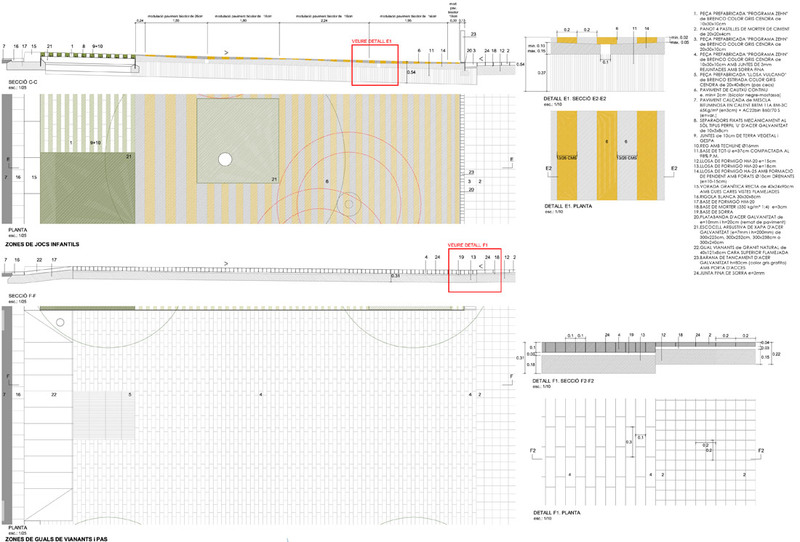 In section 3 the layout is completely different to the other two due to the transformation undertaken in the last urbanisation project. 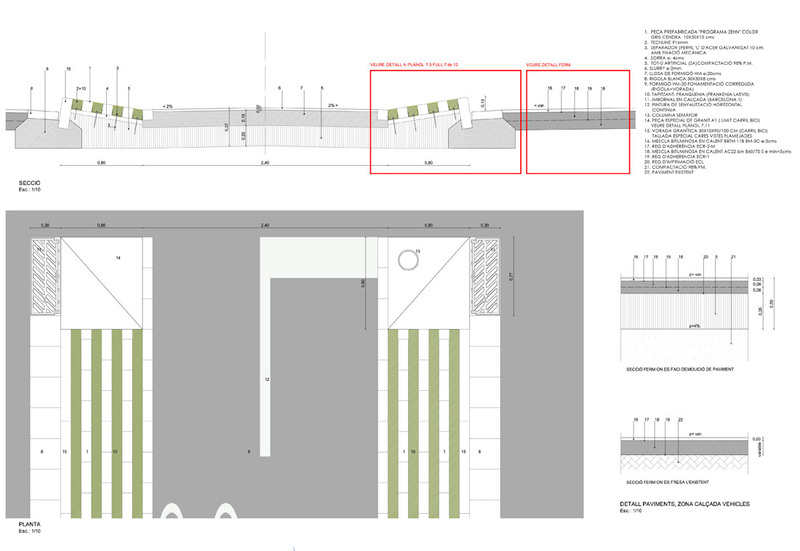 This section features a central 29m pedestrian promenade with three 7.5m car lanes and a 3m pavement on each side. 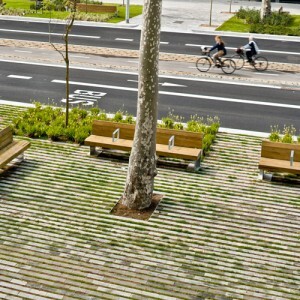 The two-way bicycle lane is situated on the promenade on the llobregat side. 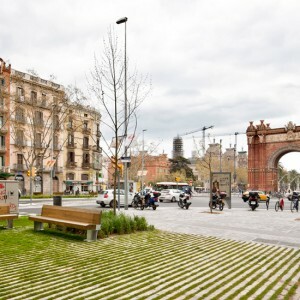 The new remodelling proposal sets two basic objectives: to give priority to the pedestrian use of the boulevard and turn it into a new urban green zone extending right up to Ciutadella park. 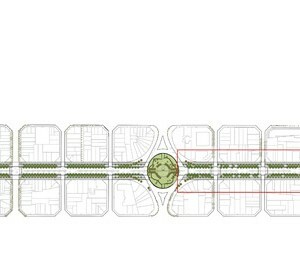 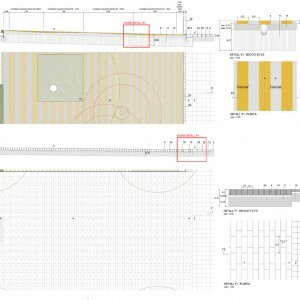 1. to guarantee the continuity of the section along the length of the boulevard. 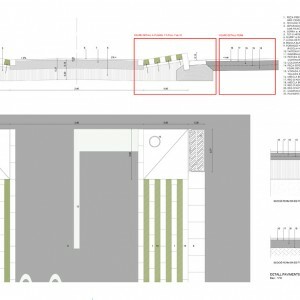 Despite the fact that this part of the boulevard currently consists of 3 differentiated sections the remodelling intends to create a new longitudinal section making it uniform along its entire length. 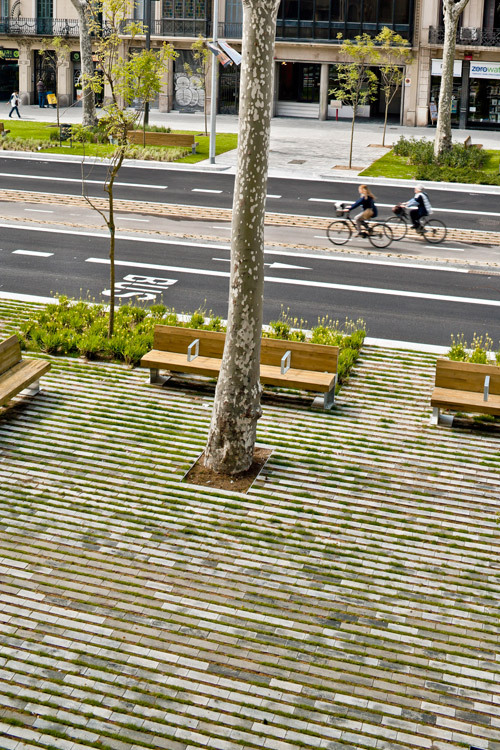 The new section is symmetrical and extends the width of the current pavements from 12.5m to 17m, maintaining the century old trees and accompanying them with two new rows of trees. 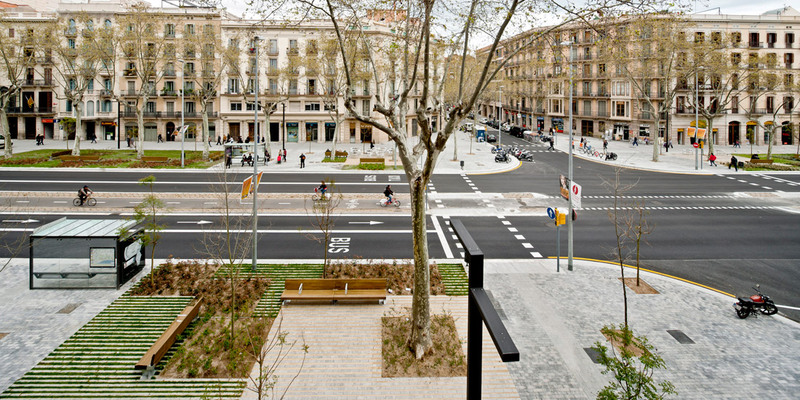 The layout’s continuity is absolutely essential in order to ensure functional clarity along the entire length of the boulevard. 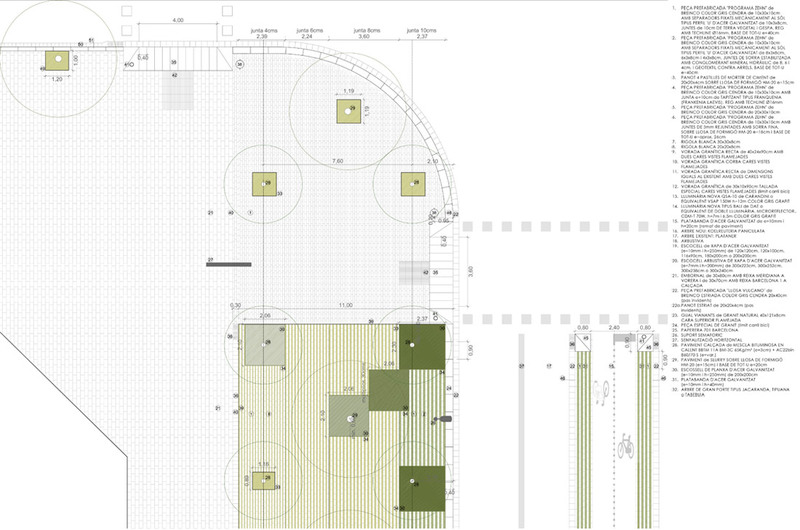 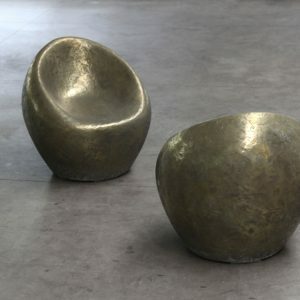 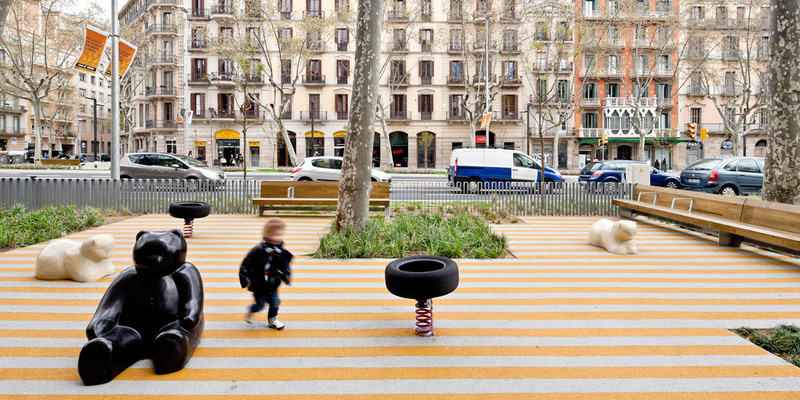 2. to adapt the urban space to different uses. 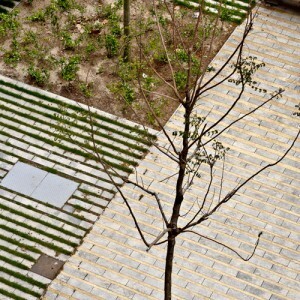 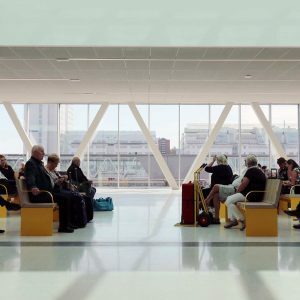 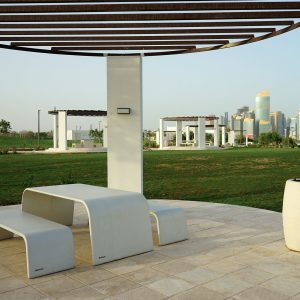 The new section must cater to the different uses of this urban space whilst enabling them to coexist harmoniously. 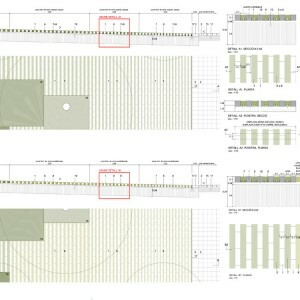 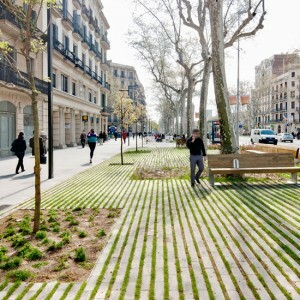 The 17m of pavement have been organised in such a way that 6m are allocated to a pedestrian pavement whilst the remaining 11m under the rows of trees are for recreational uses (benches, children’s play areas and bar terraces). 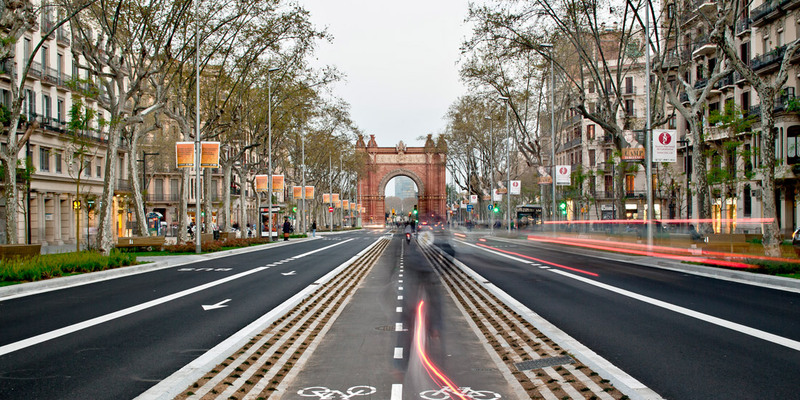 Previous road traffic surveys showed that the original road was too large. 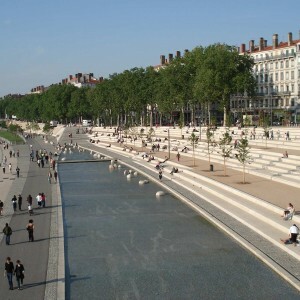 So it was possible to reduce the space allocated to traffic and turn it into a pacified transit zone. 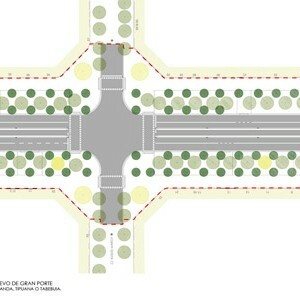 As part of the new layout, the two-way 4m bicycle lane is physically segregated, protected and signposted, located in the middle of the road. 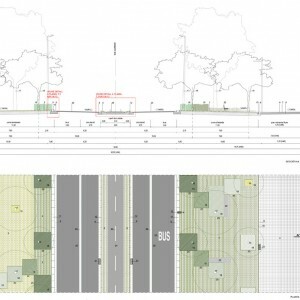 The key tenets of the new proposal are to reduce the number of traffic lanes, create leisure zones under the trees and segregate the bicycle lane. 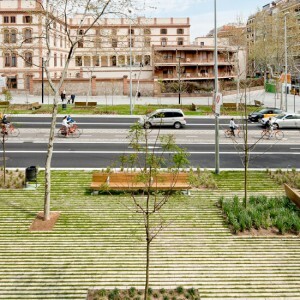 3. to promote the passeig de St Joan as a new and sustainable urban green zone. 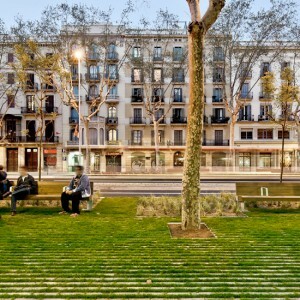 Passeig de Sant Joan, which, with its prolongation via the Passeig de Lluís Companys reaches right up to Ciutadella park has been projected as the city’s new green zone. 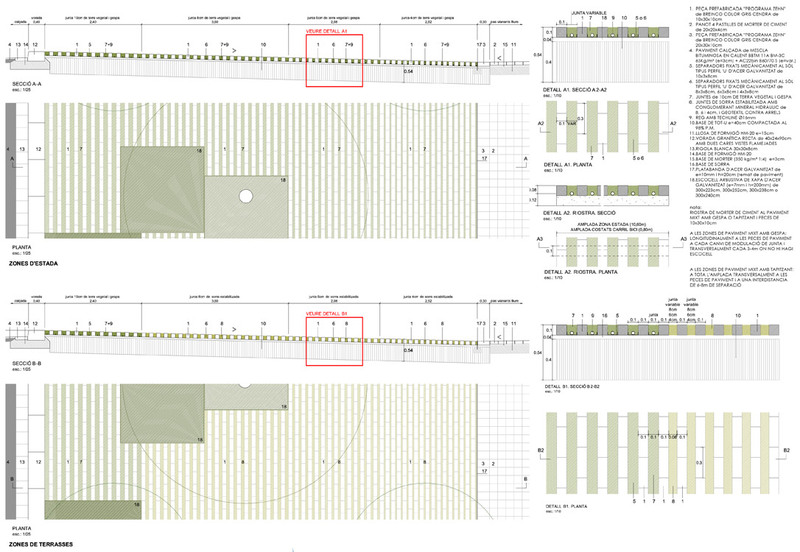 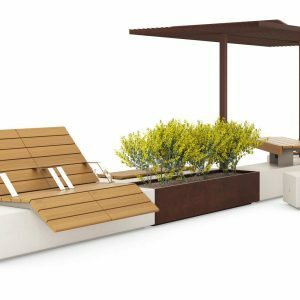 In order to achieve this, two new rows of trees will be planted on both sides of the existing century old trees to create an area of natural shade that will accommodate the new recreational zones, children’s playgrounds and bar terraces. 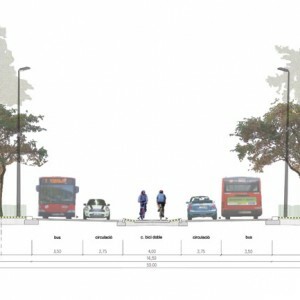 In order to guarantee the sustainability of this new layout we need to ensure proper drainage of the subsoil and take on the challenge of incorporating a mixed pavement system in the tree-lined zone. 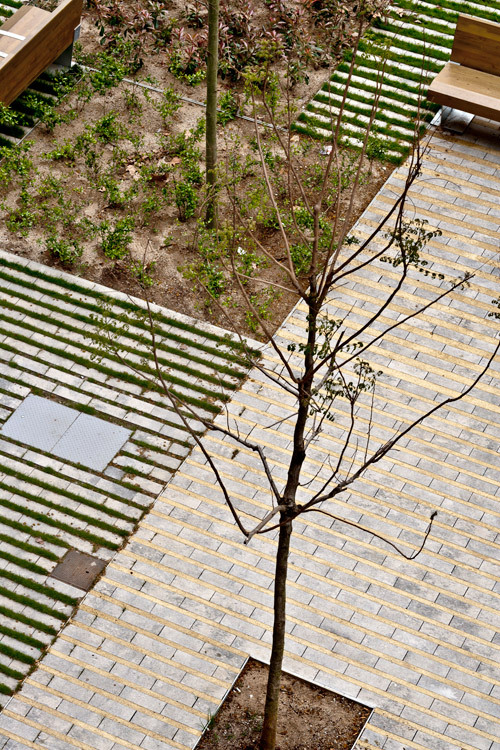 The treatment of the soil with mixed pavements and the automatic watering system that uses phreatic water are key to ensuring substrata drainage that will guarantee the survival of the vegetation. 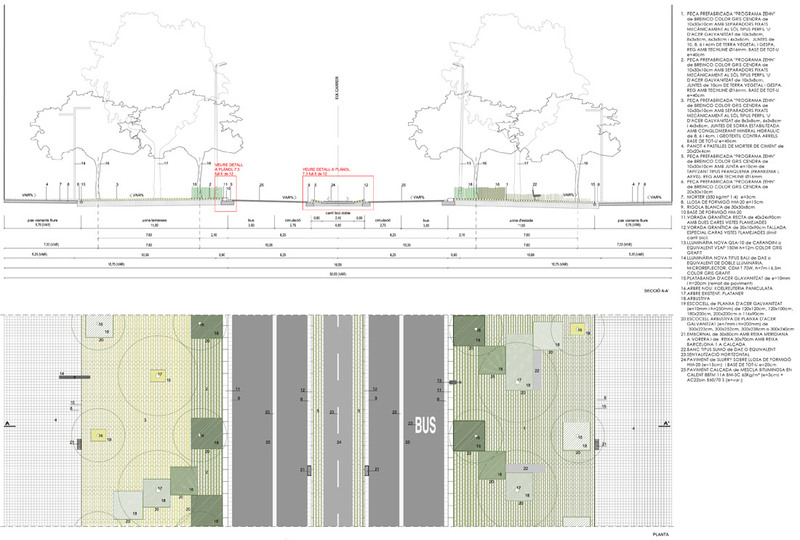 The incorporation of local shrubs to this tree lined zone will contribute to enriching subsoil biodiversity. 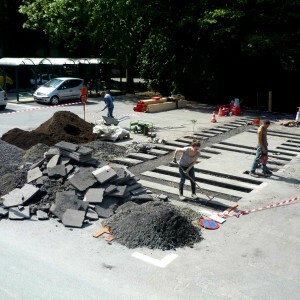 The treatment of the pavements is closely linked to the uses of the new street: on the pedestrian section the pavement is made of “panot” paving slabs (typical ensanche paving) whereas in the recreational zones a new prefabricated pavement with draining joints will be laid down. 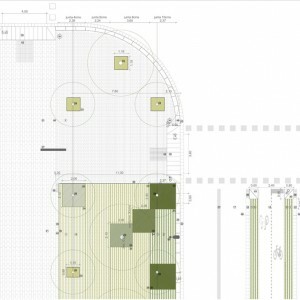 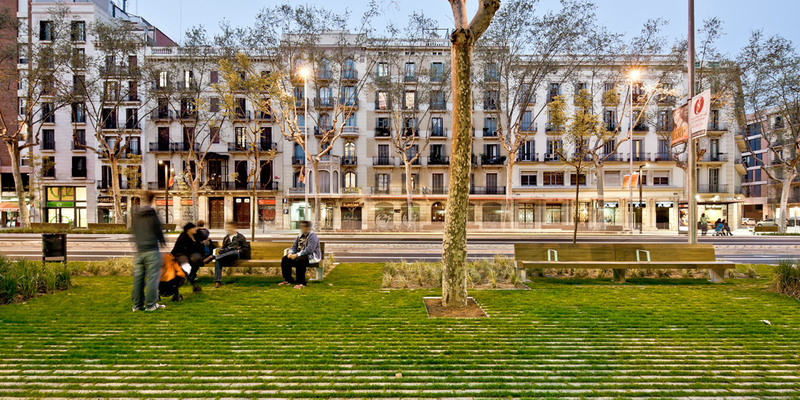 With this new proposal the Passeig de St Joan has won back its social value as an urban space that provides a variety of requested uses and functions whilst also addressing key aspects of biodiversity and sustainability. 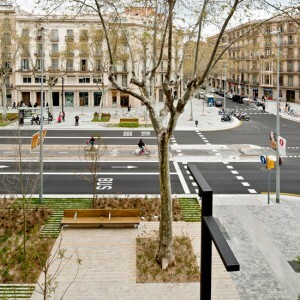 This street’s urban transformation has enabled us to revitalise its commercial life and recreational uses, whilst at the same time retrieving its historical value as a main boulevard that continues right up to Ciutadella park. 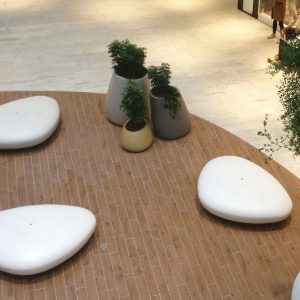 This is an excellent unobtrusive intervention, sustainably anylyzed, and designed to serve its users’ requirements 1st, while respecting its architectural context 2nd. 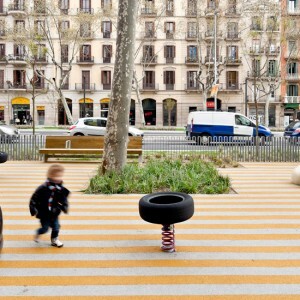 More citys should think like this. 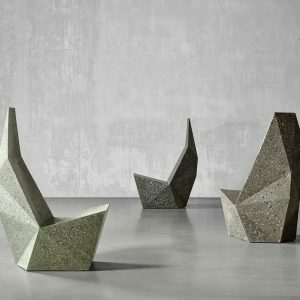 Well done, congratulations to the designers. 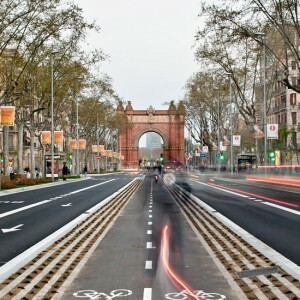 Estuve en Barcelona hace poco, una pena no tener noticias de este proyecto para haberlo visitado.